CT350A - Installers Complete CCTV Tester. 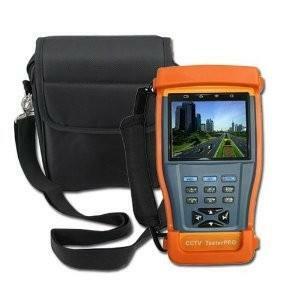 Key Features: 3.5" TFT-LCD, 960 (h) x 240 (v). Brightness, Contrast & Saturation Controls. Video In / Out. Audio Input Test. DC12v 1 Amp Power Output for Camera. PAL / NTSC multi-system Colour Bar Video Generator. Video Signal measurement in IRE or mV with On Screen Display. Cable Tester including UTP and Ethernet with Display On Screen. PTZ Control. RS485 Test Function Analyses the Command Data from a Controlling Device. Supports RS232 RS485 and RS422 interface with Baud Rates ranging from - 150,300,600,1200,2400,4800,9600 to 19200bps. Multi-Protocol support - more than 20 Protocols including Pelco D & P. Lithium-Ion Polymer Battery (3.7V DC 3000mAH). 12hours life in normal use - 4 hr charge. DC5V 2 Amp Power Supply / Battery Charger included. Operating Temperature -10C + 50C. Working Humidity 30%~90%. Dimensions (mm) - 176 x 94 x 36. Weight - 340g. An essential and High Quality tool for every CCTV installer. This Tester is supplied in a Rugged Rubberised Casing and embodies a sharp accurate 3.5 Colour Field Monitor with Video in and out plus Audio test. It generates 1 amp of power at 12V DC for pre- connection testing & a full Colour Bar. The tester also combines a Cable & UTP tester. There is also RS485 Data Analysis allowing the installer to check for control problems with more than 20 inbuilt protocols available including Pelco D and P. 12 hours use is possible with the Inbuilt High Quality Lithium Rechargeable Battery. The unit is complete with Adaptor / Charger.